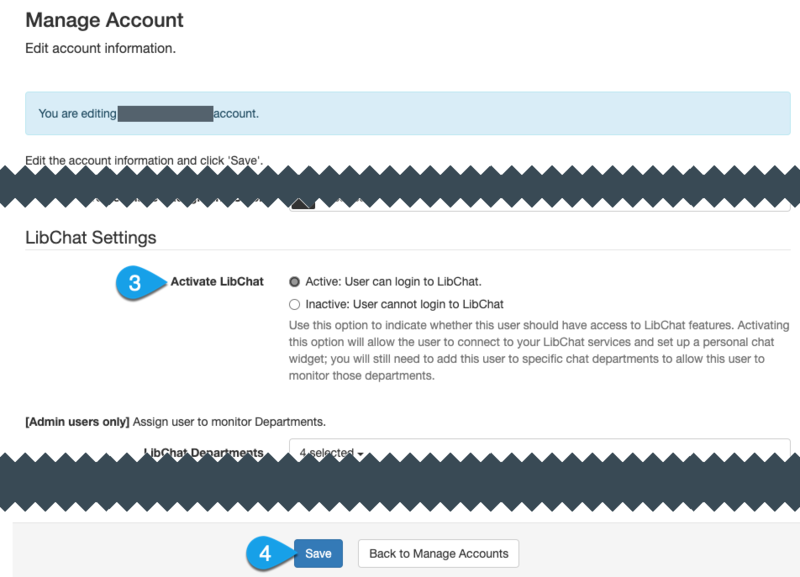 Before a user can sign into LibChat or be assigned to departments, they must first have LibChat enabled for their account. This can only be done by an Admin user under Admin > Accounts. LibChat will be enabled for all new Admin user accounts you create. LibChat will be disabled for all new Regular user accounts you create. During account creation, you will need to manually enable LibChat for the user if you want to give them access to it. What happens when LibChat is disabled? Only Admin users can enable or disable LibChat (even for their own user account). Under the Manage Accounts tab, click on a user's edit () icon in the Actions column. The LibChat Enabled? column will indicate whether a user currently has access to LibChat. Under the LibChat Settings section, use the Enable LibChat options to turn LibChat on or off for that user. Enabled: this will allow the user to login to LibChat. For Admin users, this will also allow them to customize LibChat settings under Admin > LibChat Set-up. When enabled, you and the user will be able to customize their personal LibChat settings. When a Regular user edits their own LibAnswers account settings, they will see the LibChat Settings appear. This will allow them to customize their default preferences, but not allow them to disable their own access to LibChat. Disabled: the user will not be able to login to LibChat. For Admin users, they will also be prevented from accessing LibChat settings under Admin > LibChat Set-up. When disabled, no other options will appear under the LibChat Settings section. When a Regular user edits their own LibAnswers account settings, they will not see the LibChat Settings section at all. If a user's access to LibChat is disabled, they will still see the LibChat option appear in the LibAnswers navigation bar. However, if they click on it, they will see a message indicating that LibChat has been disabled (and how it can be enabled for them by an Admin). In addition, they will not see a LibChat Sign In link on their LibAnswers dashboard (though they will still be able to see if LibChat is currently online or offline). For Admin users, they will still see the Admin > LibChat Set-up menu item. However, they will not actually be able to access or modify LibChat settings until LibChat has been enabled (which they can do for themselves, or have another Admin do it for them).